It was late September, and the weather was still like summer – hot! 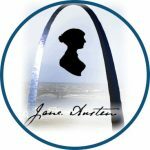 But just over 900 Janeites gathered in Kansas City for JASNA’s Annual General Meeting. Because of the proximity of Kansas City to St. Louis, a large number of St. Louis region members also attended. Thursday evening, attendees were able to watch a previously recorded interview with Amanda Root, the actress who played Anne Elliot in the much-loved 1995 film adaptation of Persuasion. But lucky us, she was also there in person to read selections from her diary and from the novel, as well as answer questions. Ms. Root is a lovely, easy-going and accessible person, even in an elevator, where we had a little chat! So began a wonderful four days packed with speakers, both plenary and break-out, as well as special sessions and, of course, a pub quiz, the banquet, the promenade, dancing, whist playing, the Emporium, where you could buy a plethora of items, even a gown for the Regency ball! Of course, many photos were taken of those gowns and other costumes during the Social Hour before the banquet on Saturday. In the special sessions, as reported by JASNA Communications: “John Mullan spoke on self-delusion in Persuasion (not just Sir Walter Eliot), Sheryl Craig on the novel’s economic background (some staggering information on the history of war-time economics and poverty), our own Sheila Hwang on Bath and Lyme Regis (they seemed to lose their ‘touristy’ and naughty appeal when people actually became residents), and historic film consultant Gordon Laco on the Royal Navy in Austen’s era (giving us a keen insight into the British navy and the films he worked on as consultant).” These plenary sessions were well-attended, and why not, such well-informed and personable presenters! A special highlight for me, besides Amanda Root and viewing the 1995 film Persuasion in its entirety, was, on Friday, “An Evening in Bath’s Assembly Rooms,” a concert featuring music actually performed at the Bath assembly rooms. The music was played on period instruments, especially a beautiful piano-forte (which had a very different sound from a modern piano – halfway between a plucked harpsichord sound and a hard-hammered string sound; instead, leather-covered hammers are used resulting in a beautiful tone). We also heard the gorgeous voice of Corrine Byrne on several selections. • “Publishing in the Era of Jane Austen,” a difficult thing for ladies of that time, by Juliette Wells. • “The Cobb as Anchor,” an interesting history of the construction and reconstruction of the Cobb, as well as a history of the picturesque, by Randi Pahlau. • “Sailors in Fiction before Persuasion,” novels in which sailors are described – their relationships with other sailors, with the people in their lives, their relationship with women (not always positive), and peerage as part of promotion (books by Daniel Defoe, Frances Burney, and Maria Edgeworth, to name a few) by Susan Allen Ford. • “The Professor is ‘In’ to Teach Persuasion” by Joan Ray, quite a revelation of the characters and themes in Persuasion. • Another “enlightening revelation,” you might say, was a special-interest session “Let There Be Light: Lighting in the Time & Novels of Jane Austen.” A detailed description was given on the making of candles made of rush (using animal fat – short-fused and smelly, but basically free), tallow candles, and beeswax candles – the most expensive. Tallow candles used in mines were colored green to prevent miners from stealing them – if as a miner you were caught in possession of a green candle you were severely punished! This talk was given by Sue Dell. A great deal of dancing and whist playing ended the Saturday activities, and on Sunday, a final brunch was shared by all. I will venture to say that everyone at the AGM had a wonderful time, thanks to the organization of Julienne Gehrer and the Kansas City Region, as well as the welcoming and well-appointed host hotel. Tagged Amanda Root, Anne Elliot, Captain Wentworth, Kansas City, Persuasion. Bookmark the permalink.